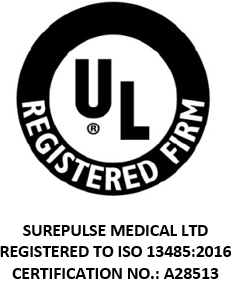 SurePulse Medical Ltd understands that your privacy is important to you and that you care about how your personal data is used. We respect and value the privacy of all of our staff, supplier, healthcare professional and customer personal data and will only collect and use personal data in ways that are described here, and in a way that is consistent with our obligations and your rights under the law. Private Limited Company [registered in England under company number 08112962]. Registered address: St Thomas House, Mansfield Road, Derby. DE1 3TN. Main trading address: Medicity, D6 Thane Road, Nottingham, NG90 6BH. VAT number: GB196 0252 05. Personal data is defined by the General Data Protection Regulation (EU Regulation 2016/679) (the “GDPR”) as ‘any information relating to an identifiable person who can be directly or indirectly identified in particular by reference to an ‘identifier’. We do not collect information from third party organisations. Supplying products and/or services to you or on your behalf. Your personal details are required in order for us to enter into a contract with you. With your permission and/or where permitted by law, we may also use your personal data for marketing purposes, which may include contacting you by email with clinical research updates, information, news, and offers on our products and/or services. You will not be sent any unlawful marketing or spam. We will always work to fully protect your rights and comply with our obligations under the GDPR and the Privacy and Electronic Communications (EC Directive) Regulations 2003, and you will always have the opportunity to opt-out. Staff personal data: We will retain your personal information for a number of purposes, as necessary to allow us to carry out our business. Your information will be kept for up to 7 years on our main systems after which time it will be deleted. Any retention of personal data will be done in compliance with legal and regulatory obligations and with industry standards. These data retention periods are subject to change without further notice as a result of changes to associated law or regulations. If you have any questions in relation to the retention of your personal data, please contact us using the details in Part 11. Suppliers: We will retain business and/or personal data in line with business needs. If you have any questions in relation to the retention of your personal data, please contact us using the details in Part 11. Customers and Healthcare Professionals: The professional data that you have provided, and that we have collected from you, might include name, title, speciality, main hospitals, institutions, places of work, addresses, contact details, including work telephone numbers and work email addresses. We will also retain records of email and/or verbal communications between both parties. Any private contact details (eg private mobile phone or email addresses) will only be held with express permission. We will retain business and/or personal data in line with business and/or information exchange needs and will never forward such personal data to any third party without your express permission (subject to Part 9 below). If you have any questions in relation to the retention of your personal data, please contact us using the details in Part 11. Where we transfer your data to a third party based in the US, this may be protected if they are part of the EU-US Privacy Shield, and this is what we insist that any relevant suppliers register with. This requires that third party to provide data protection to standards similar levels of data protection to those in Europe. More information is available from the European Commission. We share staff personal data with third parties for the provision of payroll, expenses, pension and private health provision. We may need to share relevant contact information with distributors or delivery companies in order to fulfil our contractual obligations in respect of product delivery and life-cycle management. We will not share any of your personal data with any third parties for any other purposes, subject to one important exception. All subject access requests should be made in writing and sent to the email or postal addresses shown in Part 11. To make this as easy as possible for you, a Subject Access Request Form is available for you to use on the company website. You do not have to use this form, but it is the easiest way to tell us everything we need to know to respond to your request as quickly as possible. We will aim to respond to your subject access request within 2 weeks (and, in any case, not more than one month) of receiving it. Normally, we aim to provide a complete response, including a copy of your personal data within that time. In some cases, however, particularly if your request is more complex, more time may be required up to a maximum of three months from the date that we receive your request. You will be kept fully informed of our progress. Telephone number: 0333 5 771133. Postal Address: SurePulse Medical Ltd. Medicity, D6 Thane Road, Nottingham, NG90 6BH.